Spain's election board has banned the far-right Vox party from participating in the only confirmed TV debate for the 28 April election. The controversial, anti-immigration party achieved a surprise victory in recent regional elections. Spain's Atresmedia network chose it to join the four major national parties for a debate on 23 April. However, the electoral commission ruled that Vox's inclusion would be a violation of electoral law. The network said it would respect the ruling but stood by its decision to include Vox in the debate. "Atresmedia maintains that a debate between five candidates is of the greatest journalistic value and most relevance for voters," the network said in a statement after the ruling. Spain's current Prime Minister, Pedro Sánchez, had agreed to take part in the private network's five-party debate - including Vox - rather than the four-party option proposed by a public broadcaster. However, the electoral commission ruled that Vox's inclusion was not "proportional" under its electoral rules, since it does not hold any seats in the national parliament and attracted a very small percentage of the vote in the last general election. Vox: Who are Spain's far-right party? Vox's leader Santiago Abascal responded defiantly on Twitter. "It's clear who calls the shots still in Spain: the separatists. Until April 28. Because a great victory for #LongLiveSpain will see those parties who wish to destroy our co-existence, constitution and homeland banned", he said. Several smaller parties had asked to be included in the debate, based on previous electoral performance. The 28 April ballot is being billed as a battle between the established parties, Catalan and Basque nationalists, and Vox. Founded in 2014, the party struggled to make an impact on Spain's political landscape until it took 12 parliamentary seats in Andalusia in December, beating expectations that it would win five. Vox has been derided as far-right and populist, anti-immigrant and anti-Islam but its leader Santiago Abascal believes its recent surge of support is because it is "in step with what millions of Spaniards think". Its leaders reject the far-right label, insisting it is a party of "extreme necessity" rather than extremism. Its overall support for Spain's membership of the EU, it says, differentiates it from many populist and far-right movements across Europe. The party proposes to "make Spain great again" and critics have described its ideology as a nationalist throwback to the dictatorship of Francisco Franco. 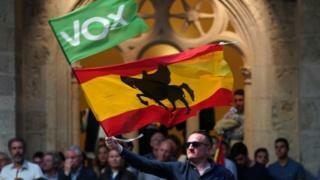 Video Vox: Who are Spain's far-right party?